Popular This Week: Internal Audit Risk Assessment Questionnaire and more! This week, we are highlighting the Top 5 Pages on KnowledgeLeader from January 7-11! Take a look at the "best of the best" of our tools that could help you simplify your audit projects. Internal audit performs this risk assessment in order to identify and prioritize the key risks to best allocate internal audit resources for the next year. 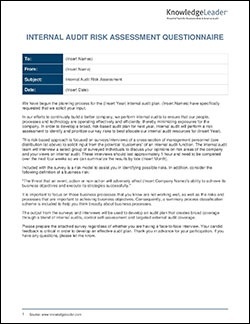 This questionnaire evaluates a company’s various processes, functions and locations in preparation for the internal audit risk assessment discussion. This exercise helps evaluate the materiality and/or strategic importance to the business as well as the perception of the likelihood or concern that problems could occur because of control weaknesses. This risk assessment questionnaire focuses on the following process areas: operational, revenue, expenditures, treasury, financial reporting, information systems, personnel and payroll. This sample internal controls checklist provides a list of items to consider when assessing internal controls for common business processes. It focuses on accounts receivable and sales controls, accounts payable controls, accrued liabilities and other expenses controls, cash disbursement controls, cash funds controls, cash receipts controls, general accounting controls, fixed-assets controls, intangibles controls, inventory and cost of sales controls, investments controls, long-term liabilities controls, notes receivable controls, payroll controls, prepaid expenses and deferred charges, and shareholders’ equity controls. An effective business process is built on a set of well-defined and clearly stated business objectives. To build and continually improve an effective business process, a company establishes: key objectives to articulate the performance results the company expects from the business process, outcome measures to determine whether the company has reached the key objectives, and activity measures to monitor the performance of instrumental activities. This tool outlines key objectives for conducting internal audits, the outcome measures associated with each objective, and the activity measures that drive each outcome measure. A link connects each outcome measure with its corresponding formula and analysis. 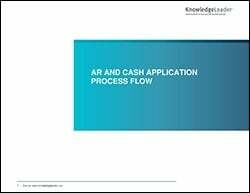 This document can be used as a general guide to understand and review the AR and cash application process. Organizations should continuously update and monitor the processes included in this document to ensure that they accurately reflect business operations.